Caltech is the destination of choice for scientists and engineers who dream of transforming knowledge and the world. Professors play an essential role in graduate students’ development both as researchers and as educators, preparing them for success wherever their career paths might lead. By asking difficult questions and encouraging creativity, faculty inspire their students to push the boundaries of knowledge. Graduate students, in turn, move research projects forward and catalyze innovative partnerships across divisions and departments. A body of exceptional graduate students makes Caltech more attractive to exceptional faculty members, creating a virtuous circle. Together, graduate students and their faculty advisors forge lasting collaborations, lifelong friendships, and breakthrough discoveries. To honor this important relationship, an anonymous benefactor has initiated a $1 million giving challenge, known as FARE (for Faculty Advisors Recognition Endowment), to endow eight new graduate fellowships at Caltech. By participating in this challenge, you can help unite the legacies of distinguished professors with the ambitions of tomorrow’s scientists and engineers. You and other friends of Caltech collectively contribute $375,000 or more to honor a FARE professor. The FARE challenge provides $125,000. Your gift, now at the $500,000 threshold, triggers the Gordon and Betty Moore Graduate Fellowship Match, which contributes an additional $250,000. Your donation—doubled to $750,000—fully endows a FARE fellowship, a transformational gift that will support generations of scholars. At this time, you can choose from two FARE fellowship funds to support. An icon in power electronics, R. David Middlebrook (1929–2010) formulated the Extra Element Theorem and its variations, which are widely used in circuit design and measurements. In 1970, he founded the Caltech Power Electronics Group, which graduated many PhD students who went on to become leaders in the field. In 1996, he received the Richard P. Feynman Prize for Excellence in Teaching, the highest teaching honor the Institute bestows on a faculty member. Anatol Roshko (MS ’47, PhD ’52; 1923–2017) led a distinguished career probing fundamental problems in subsonic and supersonic fluid mechanics. After a brief time serving in the Royal Canadian Artillery, he arrived at Caltech to pursue his studies at what now is known as the Graduate Aerospace Laboratories of the California Institute of Technology (GALCIT). After graduation Roshko remained at Caltech, serving as a research fellow, professor, and acting director of GALCIT. His collaboration with Hans Liepmann led to the widely used textbook Elements of Gasdynamics. Two FARE fellowship endowments have been fully funded. 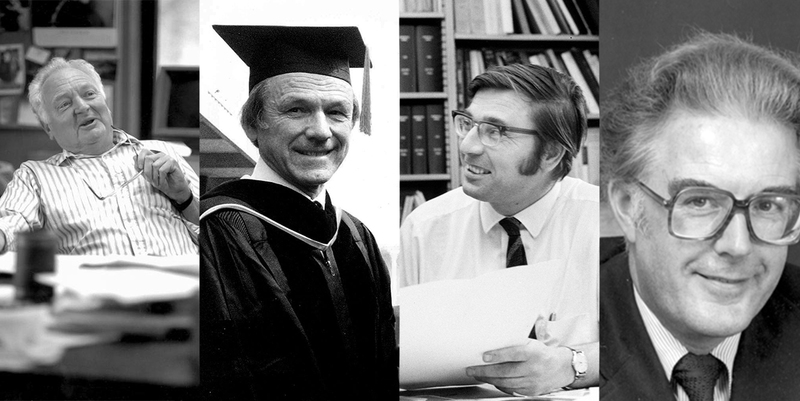 In 1973, Lance E. Davis (1928–2014) helped launch a social sciences PhD program at Caltech that brought together economics, political science, and mathematics to form new ways of analyzing and interpreting data. Davis also was a pioneer of cliometrics. Named for Clio, the Greek muse of history, cliometrics uses modern theoretical approaches and quantitative methods to provide new insights into how bygone industries actually functioned, such as the financial markets of the British Empire and the American whaling trade. The first in his family to go to high school, and first from his high school to go to college, astronomer Wallace “Wal” Sargent (1935–2012) was a Caltech professor for 45 years. His studies demonstrated that the diffuse gas between distant galaxies is primordial, showed that most helium was made in the Big Bang, and gave the first evidence for a black hole at the center of a galaxy. For a decade, he co-chaired a committee that shaped the Keck Telescope’s development. He always enjoyed involving students in research. Professor Charles Steidel (PhD ’90), a former student, remembers, “Wal passed on to his students a taste for interesting problems, a healthy degree of skepticism and self-criticism, and an attitude that celebrates the unexpected turns that often arise when one ‘looks to see what is out there.’” Read more. For more information about the match and how to support graduate education at Caltech, please email give@caltech.edu.